Cherry Clafoutis is fantastic. 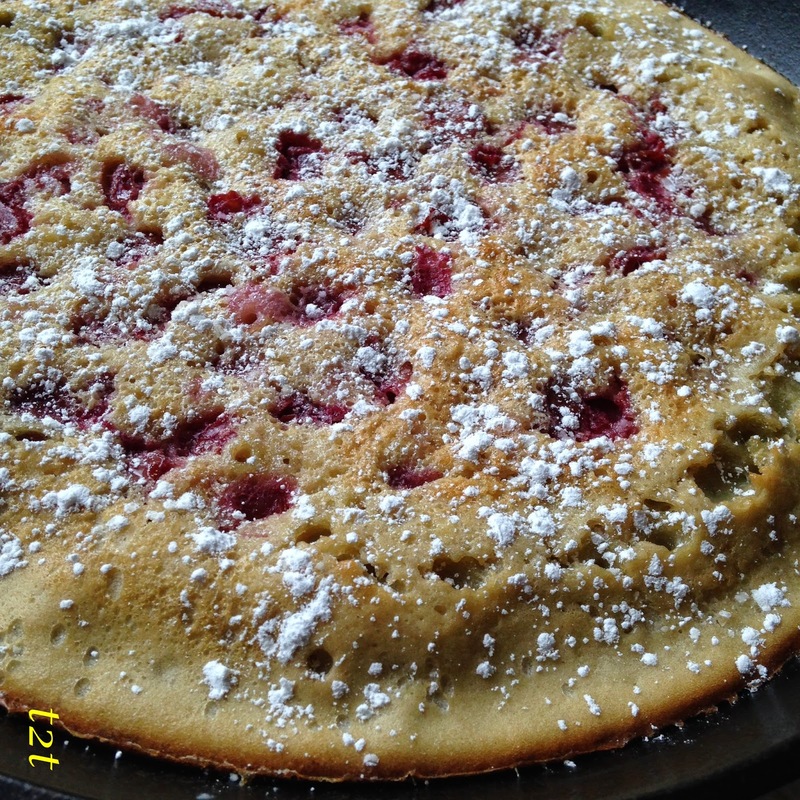 This was my first time making a Clafoutis and it won’t be the last…It’s Delicious! 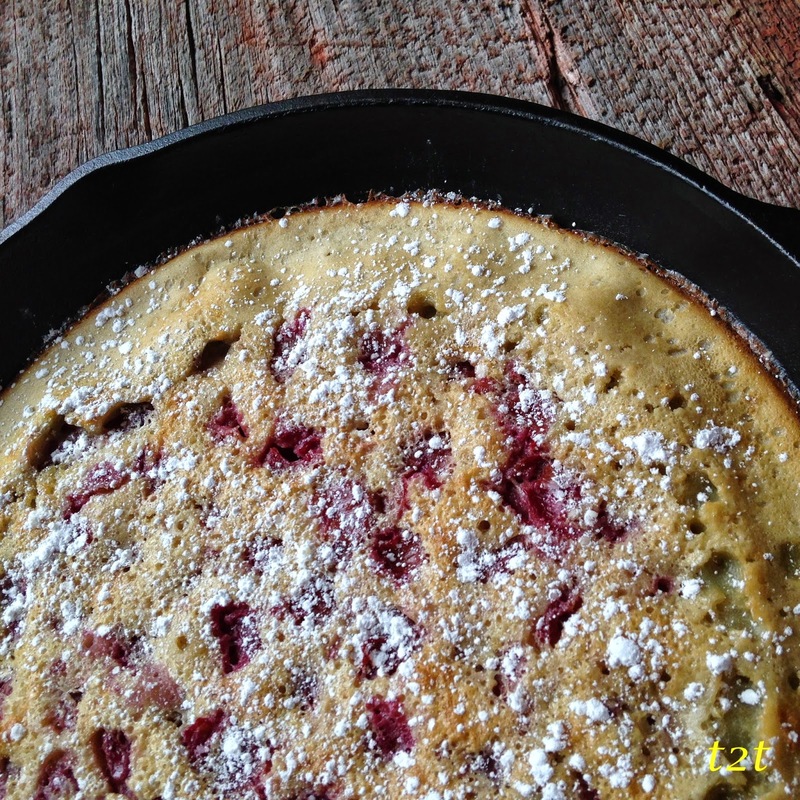 Cherry Clafoutis is made in a cast-iron skillet and makes a perfect fast and easy dessert. Most often made with cherries but can be made with any “stone” fruit. Clafoutis; clafouti [kla-foo-TEE] Priginally from the Limousin region, this country-French dessert is made by topping a layer of fresh fruit with batter. After baking it’s served hot, sometimes with cream, Some styles have a cakelike topping while others are more like a pudding. Though cherries are traditional, any fruit such as plums, peaches or pears can be used. Sour cherries are smaller, softer and more globular than the sweet varieties. Most are too tart to eat raw, but make excellent pies, preserves and the like. The bestselling sour cherry varieties are the bright red Early Richmond, the first cherry available in the late spring, Montmorency and the dark mahogany Red Morello. Heat oven to 425° Grease a 10″cast iron skillet with butter. Set aside. Combine milk, sugar, cherry juice, vanilla, eggs and salt with an immersion blender for a few seconds to mix. Add flour and blend until smooth about 1 minute. 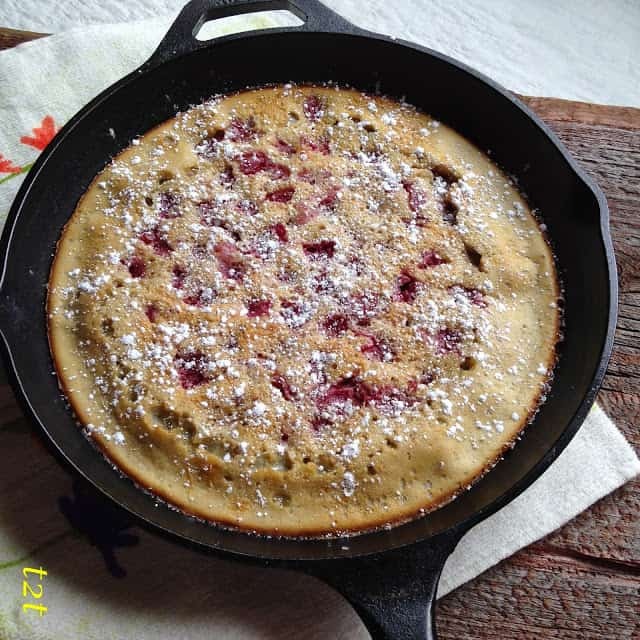 Pour batter into buttered skillet, distribute cherries evenly over the top. Bake until a toothpick inserted in the center comes out clean or a golden brown crust has formed on the top and bottom of the clafoutis, about 30 minutes. Remove from oven. I love cherry clafoutis! And I want to check out those Dutch babies too!! Great pick this month! I've nveer had clafoutis before. In fact, I've never heard of it! But it's beautiful. Such a gorgeous dish! I've never had clafoutis, but I'm starting to think I am definitely missing out! 🙂 Happy belated reveal day. Cherry clafoutis is such a classic! lovely choice for your assignment! Ooh, this looks fantastic – what a great combination of flavors! And a wonderful choice for SRC this month. YUM! Thanks, Lynn! I am so glad you enjoyed the clafoutis 🙂 It looks great! 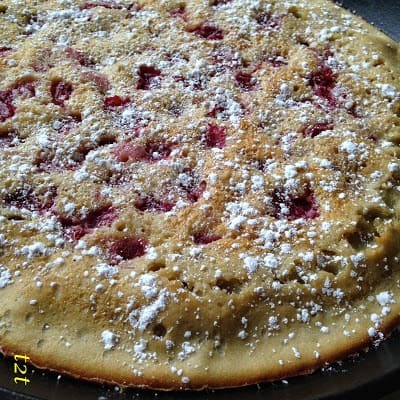 I've never made a clafoutis, but it looks delicious! I'll have to give it a try soon! Happy reveal day! I have never made clafouti either and this looks absolutely mouth watering. I think Clafoutis are so pretty. Yours is no exception. Beautiful pick! Rebekah, You have got to make a clafoutis asap! You won't be disappointed. Yum. I love clafouti, and cherry is my favourite – great pick this month. Looks great Lynn! Great choice!! Yum, this looks delicious! We have fresh cherries just coming off the trees near us, so I can't wait to get my hands on some from the farmer's market!! I've never tried making a clafoutis but it's on my to-do list!